Shona Sanzgiri is a writer/editor from San Jose that has been commuting between New York and here for the last six months. He's trying to bring some elements from New York over here in a variety of projects. 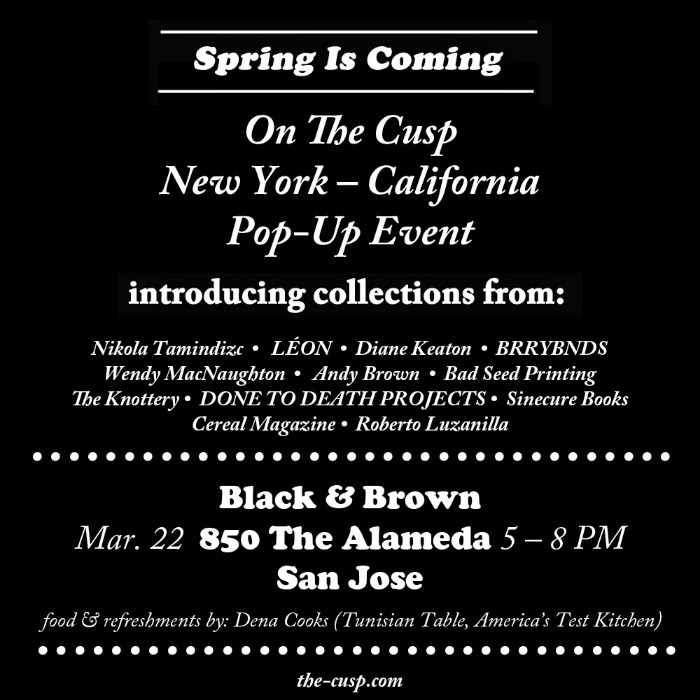 His latest one is a pop-up shop at Black & Brown on the Alameda featuring the work of clothing designers, artists, photographers, and writers from both NYC and SJ. Some of the items will include limited prints, photographs, clothing, accessories, and random curios & tchotchkes from places like Bombay's Thieves Bazaar, a photo-book by Diane Keaton, a napkin Harmony Korine once drew on, etc. The pop-up shop will be open for two weeks starting March 22nd. The opening reception will run from 5pm to 8pm tomorrow and feature food & refreshments by Dena Cooks (Tunisian Table, America's Test Kitchen). For more info you can check out the On The Cusp website.